MISSOULA, Mont. — Research on hunter demographics shows more women per capita are attracted to elk hunting than most other kinds of hunting, according to the Rocky Mountain Elk Foundation. 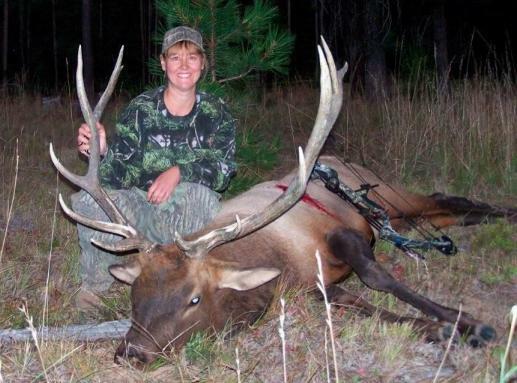 More than 60,000 elk hunters today are female. Though still predominantly a male pursuit, new data show that women compose 7.6 percent of all elk hunters. That’s greater representation than in turkey, duck, goose, dove, quail, pheasant, rabbit or squirrel hunting. In fact, among America’s most common game species, only deer hunting has a greater percentage of female participation. The Elk Foundation’s membership magazine, Bugle, has long carried a regular feature titled “Women in Elk Country.” Articles explore many reasons why women hunt, from pure adventure to providing meat for their families. A basic Elk Foundation membership, which includes a subscription to “Bugle,” is $35. Visit www.rmef.org or call 800-CALL-ELK. Membership also supports the Elk Foundation’s mission to ensure the future of elk, other wildlife and their habitat. Research data are based on the U.S. Fish and Wildlife Service’s 2006 National Survey of Fishing, Hunting and Wildlife-Associated Recreation, prepared for the National Shooting Sports Foundation’s Industry Intelligence Reports Vol. 2, No. 9, 2008.